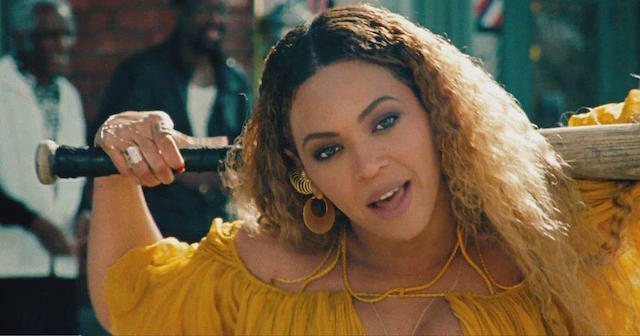 The unpreviewed release of Beyoncé’s “Lemonade” on Saturday night — you can’t really call it a surprise, given that it’s what most people were expecting — left critics scurrying to post their reactions. Less than 48 hours later, the accumulated weight of analysis already runs to tens of thousands of words, as befits an album that’s stunning in its breadth and irresistible in its gossipy particulars. Morris’ evocation of “black female spiritualism” is key because it points up the fact that “Lemonade’s” reference points not only surpass Malick, but that they diverge pointedly from the Christian imagery that so suffuses Malick’s films — especially those from “The New World On” on, which is what most people seem to mean when they say something looks like Terrence Malick. True, as David Ehrlich points out at Indiewire, one of “Lemonade’s” directors, Khalil Joseph, also worked as an editor and behind-the-scenes cinematographer on Malick’s “To the Wonder,” but he argues that even the “Pray You Catch Me” segments — his best guess for Joseph’s contribution — are “[a]s informed by Gregory Crewdson or ‘Night of the Hunter'” as by anything Malick made. “Daughters of the Dust,” which Miriam Bale also cites in her dissection for the Hollywood Reporter, is likewise an unmissable inspiration, enough that some on Twitter questioned why Beyoncé didn’t just hire “Daughters'” Julie Dash instead. For all we know, Bey and Jay end every night by curling up on the living room couch and watching “The Thin Red Line” — although maybe Jay’s been sleeping on the couch of late — but Malick’s name has become a kind of reductive shorthand for any movie that departs from a strictly linear narrative, especially if it involves voiceover narration and/or shots of vegetation. It’s the highest compliment when a director’s name graduates from proper noun to all-purpose adjective, but it invariably means reducing their body of work to a few easily recognizable traits, and, more importantly, giving them ownership of those qualities. Is a movie suspenseful? Must be Hitchcockian. Is there weird stuff going on with people’s bodies? “Cronenbergian” is here to help. With “Lemonade,” the Malick comparisons aren’t just facile, but they substantially understate its sprawling visual ambition, not to mention its pronounced political and cultural intelligence. One thing “Lemonade” does (apparently) have in common with Malick’s movies is that it’s intensely personal in ways we may never quite understand: Malick’s last three movies correlate strongly with what little we know of his personal life, but unless he decides to do his first interview in decades, we’ll never know for sure, and while Beyoncé did recently give her first extensive interview in three years, she cannily did it before anyone could ask her about “Lemonade.” Beyoncé is a hell of a lot more visible than the publicity-shy Malick, but “Lemonade” makes us question how well we know her, and how much we have the right to.